Yesterday we introduced per second request limits to our API to ensure consistent service for all customers, we've had to implement this due to two main situations that have arose recently. Our customers who are under a sustained denial of service attack tend to have bursts of extremely high requests per second to our API, often they are checking the same addresses over and over again in quick succession due to them not caching the queries they make to us. We've been receiving multiple denial of service attacks targeting us directly which are tuned to exhaust our CPU resources. So to stop these situations from reducing our quality of service we have introduced a per customer per node per second request limit of 100. Now that is a lot of pers so I will explain in a little bit more detail how the limit is actually enforced. The soft limit is between 101 and 125 requests per second. (Your request will succeed, with a warning message). The hard limit starts at 126 requests per second. (Your request will be denied). Currently there are 4 nodes in the cluster which means if you are able to distribute your requests across multiple IP Addresses you're more likely to evenly load the cluster which will raise your per second soft request limit from 100 to 400 and your hard limit from 125 to 500. Each individual customer can make 100 requests per second to each of our nodes or 400 requests per second to the cluster as a whole. What this means is, if you go over the limit in the current second and you receive a warning or denied response from the API, by the next second your queries will be answered again and the allowance per second is reset. We're not recording how many queries you make over minutes or hours and then dividing that volume by seconds, this is a truly per-second limit and so you won't be penalised for a short burst of very high requests. What this means is, you can still send multiple IP Addresses to be checked in a single request. The current limit is 10,000 addresses in a single request, if you did so that would count as one request in the second we receive it and not 10,000 requests. Based on our research we believe these limits are some of the most liberal of any API of this type. We've seen services which have limits of less than 100 queries per minute and we're offering 100 per second (or 400 when evenly loading our cluster). We believe our limits are very reasonable, if you took our largest pre-configured plan of 10.24 Million queries per day you would need to make 118 requests per second over a 24 hour period to utilise that full plan (when performing one query per request) and it's very likely you would evenly load our cluster during that time putting you well within the 400 requests per second soft limit, but even if all your traffic was always directed to a single node you would still be under the 126 requests per second hard limit. Of course this is our first foray into request limiting and we may alter the limits in the future, rest assured we will fully detail any and all changes. And remember as we add more nodes to the cluster the overall cluster request limit will keep rising. Today we have rolled out new versions of our v1 and v2 API's with a focus on reducing query processing time and the improvement is quite drastic. Prior to today it was common to have a full query which means having all flags enabled (VPN, ASN, Inference etc) take between 7ms and 14ms to process. Today we've been able to reduce that to between 1ms and 3ms on average. The way we've been able to accomplish this is by porting some of our changes that we've created for our yet unannounced v3 API back to v1 and v2. The changes are mostly structural dealing with the processing of our code, how it's compiled and cached between queries and finally how it's executed again for subsequent queries. Although we've always reused processes for different queries (due to the time it takes to setup a new process being too long) we're now doing it more efficiently with more data being retained by these processes so they don't need to reload as much information into memory between queries. We've also altered our caching system for our code to have a tiered storage approach. Code files are now loaded from disk into memory by one of our processes and then the opcache retrieves the code from that memory based file cache before compiling it and storing the subsequent opcode in memory. This results in more consistent performance as the opcache no longer needs to reload or check modified dates of code files from our physical disks, they are instead held in memory by our file based caching process. This change is important because opcache checks code files frequently to determine if the file containing our code needs to be re-compiled and cached again, storing the files in system memory thus keeps performance consistently high over long periods of time. We're also making more efficient use of the compiled versions of our code by removing comments and other nonessential text from the code files prior to compilation which makes the compiled versions smaller and faster to run. Finally in the code itself we've reduced database calls which cause processor context switching so we waste fewer CPU cycles through gathering and sorting information and more time displaying information. This ties into the change we mentioned above with regards to our re-used processes storing more data in memory for each query to make use of. So what is the net benefit of having the API respond this quickly? ~7ms to ~3ms may not seem like a lot of time to save. But put simply, it allows us to handle 2.3 times more queries per second on each cluster node. It also means we can answer your specific queries faster so you're not waiting as long for an answer from us, that allows you to use the API in more time sensitive deployments. Some of our customers are already so physically close to our infrastructure they can receive an answer (including network overhead) in under 20ms so we're getting to the point where every single millisecond we save counts. Yesterday between 11:12 PM and 11:59 PM GMT+1 we were faced with a DDoS attack of substantial size. The attack was so large it produced five times the API query volume than we normally receive. We found that 25% of our customer traffic was subject to this increased latency. The other 75% continued to receive low response times of around 15ms to 30ms. The reason for this is due to the attack coming in frequent but short bursts. Likely a coordinated attempt to create the highest impact on our service quality. We don't know who is behind the attack at this time as we have received no communication from those responsible. We're not yet planning any changes to our infrastructure as a result of this attack but we are monitoring our service closely and may introduce more nodes to the cluster if we feel it's warranted. Thanks for reading and we hope you're having a great week. Today we've introduced a new feature to the v2 API endpoint which allows you to get a risk score for an IP Address. This draws on the immense volume of attack data we have combined with our knowledge of active proxy servers and virtual private networks. Above is an example query and just below the proxy and type responses you can see a new risk score. This can range from 0 to 100 and it's a percentage value. Anything below 33% is considered a low risk while between 34% and 66% is considered a high risk and anything between 67% and 100% is considered dangerous. We've added this score so that you can glean more information about an IP, specifically how dangerous it is on top of the proxy yes/no determination. Scores will generally be between 66% and 100% for positive detections depending on how much bad activity we're witnessing from that IP while negative detections will generally be below 10%. 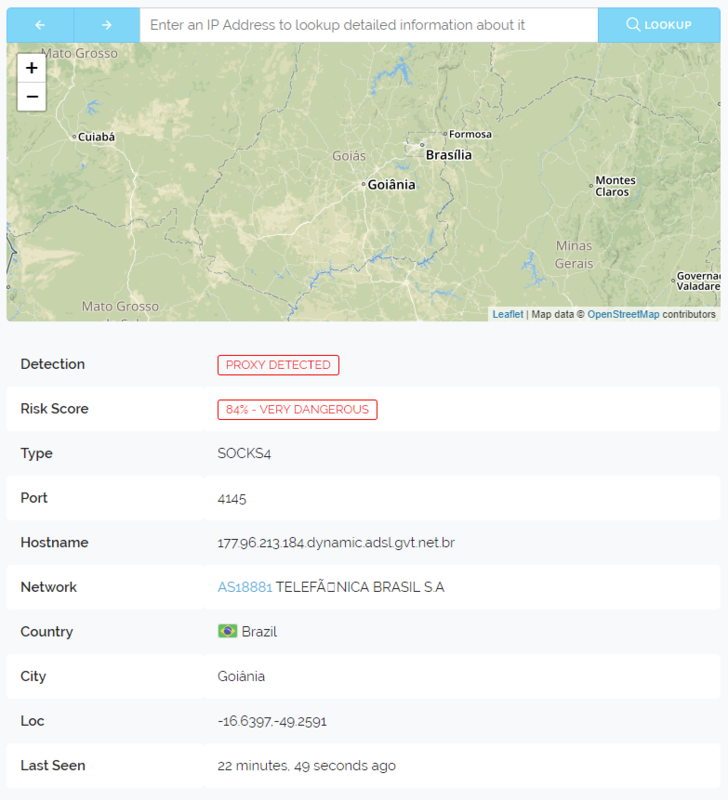 To access this new feature you must supply a new flag with your queries which is &risk=1 and please remember not to rely on this score to make all your determinations, we recommend you provision your software for proxy: yes/no although you may want to fine tune your blocking based on how risky the IP has been determined to be.